* Each time an investigator defeats a Cultist the Terror Level increases by 1. * Each time an investigator draws a Tome from any deck after dealing out starting equipment (whether he/she keeps the Tome or not) the Doom track increases by 1. 1. Lola Hayes receives $6, 2 Clues, a .18 Derringer, an Ancient Tome, a Yithian Rifle, the Find Gate spell and the Lore skill. 2. Lily Chen receives $4, 2 Clues, the Mists of Releh spell, an Understudy's Script and the Martial Arts skill. 3. Sister Mary receives $0, a Cross, some Holy Water, the Voice of Ra spell, the Mists of Releh spell, the Fight skill and a Blessing. 4. Charlie Kane receives $9, a Map of Arkham, a .38 Revolver, the services of Charles Dexter Ward as an ally and the Expert Occultist skill. 5. Kate Winthrop receives $7, 2 Clues, a Lantern, a Gladius of Carcosa, the spells Arcane Insight and Fist of Yog-Sothoth and the Bravery skill. 6. Joe Diamond receives $8, 3 Clues, a .45 Automatic, some Dynamite, a Bullwhip and the Mental Fortitude skill. 7. Rex Murphy receives $3, 3 Clues, a .18 Derringer, an Elder Sign and an Enchanted Blade, the Spectral Razor and Wither spells, the Will skill and a Curse. 1. Lola Hayes set her sliders to 5/0, 3/3 and 2/3. 3. Sister Mary set her sliders to 3/2, 2/2 and 2/5. 4. Charlie Kane set his sliders to 3/1, 5/1 and 1/4. 5. Kate Winthrop set her sliders to 4/2, 1/3 and 5/1. 6. Joe Diamond set his sliders to 6/1, 3/2 and 0/3. The Rumor "Cover-Up" is drawn and discarded as this is the initial set-up. The Rumor "Good Work Undone" is drawn and discarded as this is the initial set-up. * A Gate to the Another Dimension opens at the Woods! * The Clue at the Woods is lost. * Two monsters appear through the Gate at the Woods: a Witch and a Skeleton. * Tulzcha summons a Cultist at the Woods. * The Witch moves to Uptown. * Fight checks in Arkham are made at a -1 penalty. Lore checks in Arkham are made at a +1 bonus. Fire Vampires have their toughness increased by 1. * A Rift Marker for Neil's Curiosity Shop appears on the second Rift Track (1/4). 1. Lola Hayes left her sliders unchanged at 5/0, 3/3 and 2/3. 3. Sister Mary adjusted her sliders to 3/2, 2/2 and 3/4. 4. Charlie Kane kept his sliders unchanged at 3/1, 5/1 and 1/4. 5. Kate Winthrop kept her sliders unchanged at 4/2, 1/3 and 5/1. 6. Joe Diamond set his sliders to 5/2, 3/2 and 0/3. 7. Rex Murphy adjusted his sliders to 4/2, 3/1 and 3/3. 1. Lola Hayes moved to Independence Square and pickd up the 2 Clues there, bringing her up to 4 Clues in total. 2. Lily Chen moved to Uptown and lured the Witch into launching an unwise attack against her. Lily defeated the Witch and claimed it as a trophy. 3. Sister Mary moved to the Historical Society and picked up her first Clue. 4. Charlie Kane moved to the Silver Twilight Lodge and picked up the Clue there, bringing him up to 1 Clue. 5. Kate Winthrop moved to the Unvisited Isle and picked up the Clue there, bringing her up to 3 Clues. 6. Joe Diamond moved to the Newspaper and slipped Rex $2 - the poor guy looked like he could use a break - and accepted a medallion Rex claimed was an Elder Sign. 7. Rex Murphy moved to Hibb's Roadhouse and picked up the Clue there; his journalistic instincts - and inherent paranoia - doubled the insight he gained from the Clue, leaving him 2 Clues better off than he had been. 1. Lola Hayes gained Anna Kaslow as an ally, along with another 2 Clues (6 total). 2. Lily Chen kept Uptown safe and free of monsters, although she received no recognition for her efforts. 3. Sister Mary was blindsided by a Warlock, losing her blessing and 2 Stamina before being moved to Southside. 4. Charlie Kane convinced Ruby Standish to give him a flask of Petrifying Solution. 5. Kate Winthrop had a mosquito-infested picnic. 6. Joe Diamond had a business proposition from Doyle Jefferies. 7. Rex Murphy wasn't even lucky enough to earn a tip. * A Gate would appear at the Unvisited Isle but is stopped by Kate Winthrop and the power of Science! * The Doom Track remains at 1. * A Clue appears at the Science Building. * No monsters are returned to the cup. * A Rift Marker for the Rope and Anchor appears on the third Rift Track (1/4). 2. Sister Mary adjusted her sliders to 3/2, 2/2 and 4/3. 3. Charlie Kane kept his sliders unchanged at 3/1, 5/1 and 1/4. 4. Kate Winthrop kept her sliders unchanged at 4/2, 1/3 and 5/1. 5. Joe Diamond left his sliders unchanged at 5/2, 3/2 and 0/3. 6. Rex Murphy adjusted his sliders to 4/2, 3/1 and 4/2. 7. Lola Hayes adjusted her sliders to 5/0, 3/3 and 3/2. 1. Lily Chen moved to the Science Building and collected the Clue there (3 total). 2. Sister Mary moved to the Graveyard and picked up the Clue there (1 total). 3. Charlie Kane moved to the Black Cave and picked up the Clue there, bringing him up to 2 Clues. 4. Kate Winthrop moved to the Black Cave and passed Charlie Kane her copy of Fist of Yog-Sothoth. 5. Joe Diamond moved to the Woods and attacked the Skeleton, defeating it through the application of Mental Fortitude and a lot of lead. 6. Rex Murphy moved to the Witch House and began gathering evidence, collecting the Clue there (7 total). 7. Lola Hayes walked to the Railway Station and for $1 caught a train to Central Hill before walking to St. Erasmus House. 1. Lily Chen lost out on the chance to buy something unusual. 2. Sister Mary was attacked by a Hound of Tindalos. 3. Charlie Kane followed up enough clues to learn the Bind Monster spell. 4. Kate Winthrop spent two Clues to find enough alcohol in the Black Cave to convince Tom "Mountain" Murphy to join her as an ally. 5. Joe Diamond was pulled into Another Dimension. 6. Rex Murphy opened a Gate to the Plateau of Leng and was pulled through, while a Ghoul used the gate to gain access to Arkham. 7. Lola Hayes had an unsettling time visiting the retired sailors, losing 1 Sanity but gaining 1 Clue (7 total). 1. Joe Diamond was far too hard-boiled to be bothered by a little thing like an alien reality. 2. Rex Murphy managed to avoid freezing half to death. * A Gate to the Dreamlands opens at Independence Square! * A Tcho-tcho Priest and a Cultist emerge from the Gate at Independence Square. * A Clue appears at The Unnameable. * The Ghoul moves to French Hill. * Investigators who are Cursed, have an outstanding bank loan, possess a Detriment card, or are in jail may immediately discard the offending cards and/or may be immediately freed from jail. Those who take advantage of this offer are reduced to 0 Sanity. Sorry, Rex - you're only allowed to discard your curse by being Blessed. * A Rift Marker for the 7th House On The Left appears on the third Rift Track (2/4). 1. Sister Mary kept her sliders unchanged at 3/2, 2/2 and 4/3. 2. Charlie Kane adjusted his sliders to 3/1, 5/1 and 3/2. 3. Kate Winthrop paid 1 Sanity and attempted to cast Arcane Insight, but without success. She then kept her sliders unchanged at 4/2, 1/3 and 5/1. 4. Joe Diamond adjusted his sliders to 3/4, 3/2 and 0/3. 5. Rex Murphy adjusted his sliders to 4/2, 3/1 and 5/1. 6. Lola Hayes kept her sliders unchanged at 5/0, 3/3 and 3/2. 1. Sister Mary moved to the Unvisited Isle. 2. Charlie Kane took the spell Arcane Insight from Kate Winthrop and then moved to The Unnamable, collecting the 2 Clues there (4 total). 3. Kate Winthrop moved to the Unvisited Isle and took Mists of Releh from Sister Mary, passing Sister Mary back $4 in exchange. 4. Joe Diamond moved deeper into Another Dimension. 5. Rex Murphy stood up. 6. Lola Hayes moved to the 7th House on the Left. 7. Lily Chen moved to French Hill and dispatched the Ghoul, claiming it as a trophy. 1. Sister Mary avoided being Cursed. 2. Charlie Kane followed up enough clues to learn the Call the Azure Flame spell. 3. Kate Winthrop learned the Find Gate spell. 5. Lily Chen kept the French Hill streets safe. 1. Joe Diamond managed to avoid being ambushed by a Yithian. 2. Rex Murphy failed to find anything that might help him survive on the Plateau of Leng. * A Gate to the Great Hall of Celeano bursts open at the Graveyard! * A Cultist and a Ghast emerge from the Gate at the Graveyard. * A Clue appears at Hall School. A Clue appears at the Unvisited Isle and is picked up by either Sister Mary or Kate Winthrop. * No investigator has Asenath Waite as an ally - the Doom Track remains at 4. 2. Kate Winthrop kept her sliders unchanged at 4/2, 1/3 and 5/1. 3. Joe Diamond left his sliders at 3/4, 3/2 and 0/3 and used his Focus to refresh his Mental Fortitude Skill. 4. Rex Murphy adjusted his sliders to 3/3, 3/1 and 5/1. 5. Lola Hayes kept her sliders unchanged at 5/0, 3/3 and 3/2. 7. Sister Mary picked up the Clue (2 total) and adjusted her sliders to 4/1, 2/2 and 4/3. 1. Charlie Kane moved to the Railway Station and paid $1 for a ride to Central Hill. 2. Kate Winthrop remained in place at the Unvisited Isle, determined to resolve the strange magnetic anomalies picked up by her equipment. 3. Joe Diamond stepped back through the Gate and into the Woods; the then managed to track down the Cultist, although he nearly lost the trail. 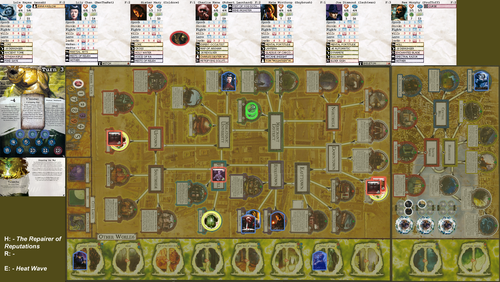 Joe gunned down the Cultist and Charlie Kane discarded two Clues to stop people panicking as a result. 4. Rex Murphy moved deeper into the Plateau of Leng. 5. Lola Hayes moved to the Hall School and picked up the Clue there (8 Total). 6. Lily Chen moved to Independence Square and cast Mists of Releh to try and track down and kill the Cultist, before attacking the Tcho-tcho Priest. The battle cost Lily 3 Sanity and 4 Stamina but she was ultimately victorious. 7. Sister Mary moved to St. Mary's Hospital. 1. Charlie Kane kept the Central Hill streets safe..
2. Kate Winthrop narrowly avoided being Cursed. 3. Joe Diamond sealed the Gate with an Elder Sign, claiming it as a trophy but losing 1 Sanity and 1 Stamina in the process. 4. Lola Hayes reminisced about her school years and cleared the Rift Marker at the Hall School. 5. Lily Chen was pulled through the Gate to the Dreamlands. 6. Sister Mary got some emergency medical attention, restoring her Stamina to 2. 1. Rex Murphy couldn't negotiate with the natives and lost 1 Stamina to exposure. 2. Lily Chen had to pay $2 in fines for stealing apples. * A Gate burst would occur at the Unvisited Isle but is prevented by Kate Winthrop and the power of Science! * A Clue appears at the 7th House on the Left. Another Clue would appear at the Graveyard but is instead swallowed by the Gate. * The Ghast moves to Rivertown. * Investigators who end their movement in Central Hill gain 2 Clue tokens and lose 1 Sanity and 1 Stamina. * A Rift Marker for 607 Water St. appears on the second Rift Track (2/4). 1. Kate Winthrop adjusted her sliders to 4/2, 2/2, 5/1. 3. Rex Murphy adjusted his sliders to 2/4, 3/1, 5/1. 5. Lily Chen adjusted her sliders to 4/1, 5/1, 4/1, 6/5, regaining 1 Sanity in the process. 7. Charlie Kane kept his sliders unchanged at 3/1, 5/1, 4/1. 2. Joe Diamond moved to South Church. 3. Rex Murphy returned to the Witch House from the Plateau of Leng. 4. Lola Hayes moved to Central Hill and passed her Ancient Tome to Charlie Kane and received a Map of Arkham and the Arcane Insight spell in exchange, before paying $1 to return to Arkham. 5. Lily Chen moved deeper into the Dreamlands. 7. Charlie Kane stayed at Central Hill. 1. Kate Winthrop restored 1 point of Sanity. 2. Joe Diamond donated his Gate Trophy from Another Dimension to the Church, and Rex Murphy was blessed as a consequence - ending his family curse. 3. Rex Murphy closed and sealed the Gate to the Plateau of Leng. 6. Charlie Kane kept the Central Hill streets safe.